Component set for CNC Lathe conversion of the Little Machine Shop 7 x 16 Mini Lathe (Catalog # 5100). 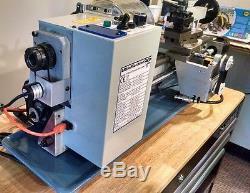 This lathe is a 7" x 16" lathe with a strong DC variable speed motor. 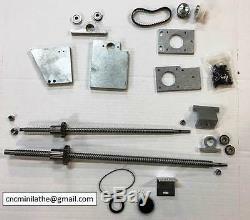 The CNC component set includes the following. 2 Ballscrews with pre-loaded ballnuts for X and Z axis. Mounting hardware for NEMA 23 stepper motors on X and Z axis. Mounting hardware for rotary encoder to enable threading (Rotary Encoder is NOT included). Instructions for making the conversion to your lathe. This conversion has been designed to allow a minimum amount of modification to the base machine. You will need to drill 2 holes in the right end of the bed and 2 holes in the top slide. Drill one more hole to mount the Encoder and you are done with the mods to the base machine. Everything else is disassembly/assembly from there. Here is a link to instructions. CNC4PC offers an electronics kit that includes the proper encoder and controller. The item "CNC Lathe Conversion Kit for Little Machine Shop 7 x 16 Threading Capability" is in sale since Tuesday, January 24, 2017. This item is in the category "Business & Industrial\CNC, Metalworking & Manufacturing\Metalworking Tools\Metalworking Inspection & Measurement\Micrometers". The seller is "splicerguy" and is located in Rochester, Michigan. This item can be shipped to United States, Canada, United Kingdom, Denmark, Romania, Slovakia, Bulgaria, Czech republic, Finland, Hungary, Latvia, Lithuania, Malta, Estonia, Australia, Greece, Portugal, Cyprus, Slovenia, Japan, China, Sweden, South Korea, Indonesia, Taiwan, South africa, Thailand, Belgium, France, Hong Kong, Ireland, Netherlands, Poland, Spain, Italy, Germany, Austria, Bahamas, Israel, Mexico, New Zealand, Singapore, Switzerland, Norway, Saudi arabia, Ukraine, United arab emirates, Qatar, Kuwait, Bahrain, Croatia, Malaysia, Chile, Colombia, Costa rica, Panama, Trinidad and tobago, Guatemala, Honduras, Jamaica, Viet nam, Philippines.